The need has never been more pressing. VGD slips behind the wheel of EA Criterion’s bruising arcade racer. Whenever a game feels obliged to dip its toes into the murky waters of morality – and thanks to Peter Molyneux and the bleeding heart brigade, rare are those games that don’t feel obliged to dip said toe – it’s generally assumed that good people have less fun. Evil-doers are invited to indulge themselves, blowing up puppies at the drop of a karma point, while guardians of the common weal must live out their days breathing quietly, straightening bent nails and getting the kids to bed by 8pm. Not so the law enforcers of Southcrest County, on whose roomy, gently curving fictional roadways Criterion’s Need for Speed: Hot Pursuit takes place. Southcrest County! Where patrolmen bust daredevil racers by hurtling into them so hard they flip clean over the bonnet and bounce off the car behind. Where cop helicopters (“cop-ters”?) casually unroll ribbons of steel barbs across bustling motorways. Where totalling a civilian vehicle by accident costs you bonus points, rather than ensuring that you’ll spend the rest of your career behind a desk. There isn’t even a plot to explain away the absence of police restraint, other than the few lines you’re given in each event briefing – and a damn good thing too, previous efforts in Need for Speed storytelling being akin to the dribble down the title page of a Roland Emmerich screenplay. Does it look good and perform well? Yeah, you could say that. You could also say: locked at 30 fps, no tearing, low latency, 720p. Thumbs up. It’s not the only franchise darling the minds behind Burnout Paradise have sacrificed. Hot Pursuit is one of the most aggressively pared-back – or, if you prefer, cleaned-up – sequels I’ve played in a while. Under the bonnet customisation? Out on its arse. Ride pimping? Gone, save for a half-dozen whole-body paint-jobs. RPG skillsets? Flayed away. AI wingmen? Nuked. Terrain traps, “heat” levels, speed camera races? Nixed, nurfed, nobbled. We’re left with 66 dazzlingly modelled supercars, a world map screen where new events (and routes) are unlocked by gaining ranks in either the SCPD or underground racing scene, the throwaway option to free roam, and a slender mode selection whose standout is the titular Hot Pursuit, which sees underground racers jostling to the finish while evading the fenders of the wrathful fuzz. In case barging other cars into track boundaries or spinning them out with a timely clip wasn’t energetic enough for you, each faction gets four fanciful “weapons” to deploy against hostile traffic. Cops can call in roadblocks, unload spike strips behind their cars or summon a helicopter to drop one in front of the pack, and blow the circuits in a target with an electromagnetic pulse. 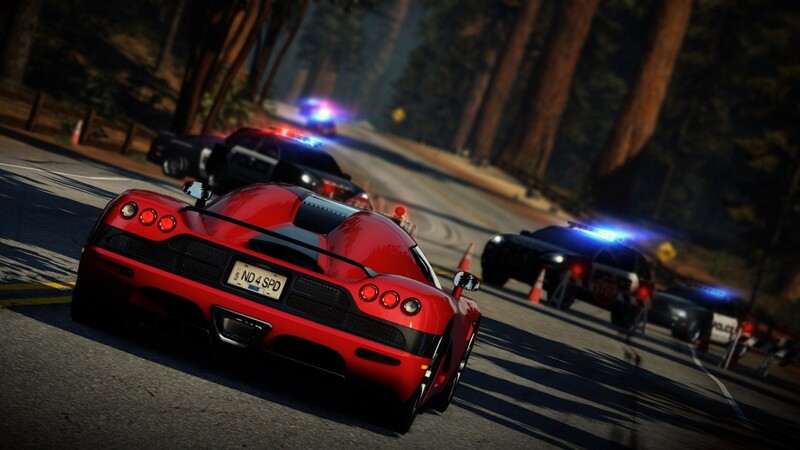 Racers also get spike strips and EMPs, but their other abilities are geared to evasion: a turbo boost, knocking the air out of the audio before slamming on the afterburner, and a jammer, which briefly silences police radios. Hint: aim for the bit where the police cars aren't. Scoring a hit with one of the offensive tools is a sensation. Whenever somebody’s tyres fall victim to your spikes the game toggles auto-pilot, cutting away to leer over the carnage in slow motion. And there’s nothing quite like the satisfaction of arriving at a roadblock to discover a former speed-freak, health in the red, attempting dazedly to negotiate a quartet of Range Rovers. For all the viscerality, though, nothing feels over-powered, partly because there are no mid-race pick-ups but also because each special ability is designed to compliment, rather than overrule, one’s mastery (or not) of the corner-friendly arcade handling model. EMPs don’t so much damage as disorient, and require that you keep the other car locked for a few seconds. Spike strips are easy to see, boasting bright red running lights. Even upgraded road blocks have their soft spots. Criterion has referred to the relation between enforcer and enforced as akin to a dog chasing down a rabbit, and providing we accommodate the prospect of the rabbit side-swiping the dog into an oncoming camper van, the analogy holds. 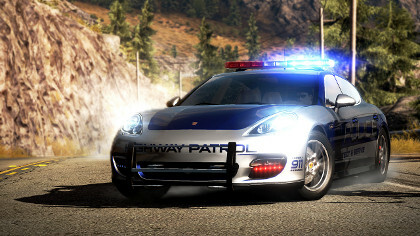 Faster, tougher cop vehicles have the advantage on the straights, while racers must use civilians (or, indeed, their rivals) as a screen, keeping one eye out for off-road shortcuts. Nitrous has a more than usually nuanced role to play in distinguishing styles: enforcers recharge it simply by keeping pedal to metal, but racers must drive dangerously – hogging the opposite lane, for instance – for their precious, precious speed-fluid. The game’s very forthcoming with the unlockables, rolling out virgin hubcaps, untried engines and weapon upgrades at a rate of one every couple of events – assuming you score a merit or above, which isn’t difficult, the AI being a mild beast. Besides having no respect for granny drivers, the police of Southcrest County certainly do enjoy a bit of gloss. If you’re looking for real challenge, the place to look is online – not that you’ll have to, as in a Facebooky twist, the trials and tribulations of friends and rivals are broadcast continually into single player via EA’s much-sung Autolog system. Should a mate flatten your best time on a particular event, you’ll be told about it and invited, with a squeeze of R2, to reclaim your podium spot. Having done so, you might add insult to injury by posting a picture and some gloating remarks to your Wall. It’s a smart, obligingly integrated system. And it keeps your gaze turned towards the eight-slot multiplayer, which is where the new Need for Speed deserves to be experienced the most. Running on the same courses with the same mode suite, and sporting no netcode issues at the time of writing, multiplayer Hot Pursuit is a blast. Racers pair off to cripple an isolated copper, then go for each other’s throats during the final mile. Coppers fry racers as roadblocks loom, leaving them unable to avoid collision. 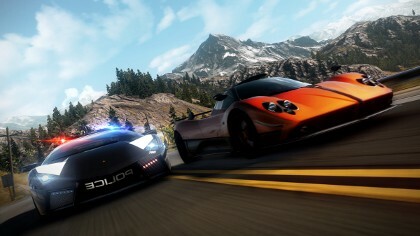 Even prior to the full-scale revamp that began with SHIFT‘s unveiling back in January 2009, the Need for Speed franchise has been characterised by constant revision, darting between intense cockpit simulation and splashy cartoon absurdity, hair-trigger cornering physics and driftsville, tight-lipped garage sim and mouthy gangsta flick. This instalment is the pick of the lot. 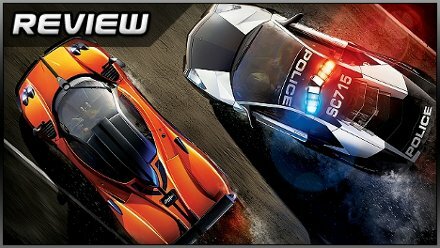 It’s a game built round a single mode, in effect, but with its hefty community presence, asymmetrical flex and raw kinesis, it offers more entertainment value than racers many times its size on paper. 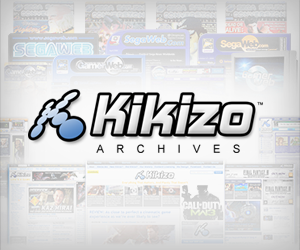 Posted in Reviews, Top 5, and tagged with criterion games, ea, Electronic Arts, hot pursuit 2, hot pursuit 2010, nfs, racing.